For a great many reasons, research on mental illness is focused on the frontal cortex. Its just a small part of the brain, and certainly, many things can go wrong in other places during brain/cognitive development, but, it remains a robust finding, that when the frontal cortex is not working well, individuals have difficulties in regulating thoughts and emotions. Life is difficult enough to manage, let alone without a well functioning frontal cortex. So its no surprise that many laboratories look very closely at how this region develops prenatally and during childhood. One of the more powerful genetic methods is the analysis of gene expression via microarrays (here is a link to a tutorial on this technology). When this technology is coupled with extremely careful histological analysis and dissection of cortical circuits in the frontal cortex, it begins to become possible to begin to link changes in gene expression with the physiological properties of specific cells and local circuits in the frontal cortex. The reason this is an exciting pursuit is because the mammalian neocortex is organized in a type of layered fashion wherein 6 major layers have different types of connectivity and functionality. The developmental origins of this functional specificity are thought to lie in a process known as radial migration (here is a video of a neuron as it migrates radially and finds its place in the cortical hierarchy). As cells are queued out of the ventricular zone, and begin their migration to the cortical surface, they are exposed to all sorts of growth factors and morphogens that help them differentiate and form the proper connectivities. Thus, the genes that regulate this process are of keen interest to understanding normal and abnormal cognitive development. Here’s an amazing example of this – 2 papers entitled, “Infragranular gene expression disturbances in the prefrontal cortex in schizophrenia: Signature of altered neural development?” [doi:10.1016/j.nbd.2009.12.013] and “Molecular markers distinguishing supragranular and infragranular layers in the human prefrontal cortex [doi:10.1111/j.1460-9568.2007.05396.x] both by Dominique Arion and colleagues. In both papers, the authors ask, “what genes are differentially expressed in different layers of the cortex?”. This is a powerful line of inquiry since the different layers of cortex are functionally different in terms of their connectivity. 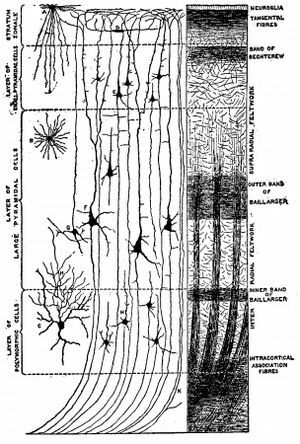 For example, layers II-III (the so-called supragranular layers) are known to connect mainly to other cortical neurons – which is different functionally than layers V-VI (the so-called infragranular layers) that connect mainly to the striatum (layer V) and thalamus (layer VI). Thus, if there are genes whose expression is unique to a layer, then one has a clue as to how that gene might contribute to normal/abnormal information processing. The authors hail from a laboratory that is well-known for work over many years on fine-scaled histological analysis of the frontal cortex at the University of Pittsburgh and used a method called, laser capture microdissection, where post-mortem sections of human frontal cortex (area 46) were cut to separate the infragraular layer from the supragranular layer. The mRNA from these tissue sections was then used for DNA microarray hybridization. Various controls, replicate startegies and in-situ tissue hybridizations were then employed to validate the initial microarray results. In first paper, the where the authors compare infra vs. supragranular layers, they report that 40 genes were more highly expressed in the supragranular layers (HOP, CUTL2 and MPPE1 were among the most enriched) and 29 genes were highly expressed in the infragranular layers (ZNF312, CHN2, HS3ST2 were among the most enriched). Other differentially expressed genes included several that have previously been implicated in cortical layer formation such as RLN, TLX-NR2E1, SEMA3E, PCP4, SERPINE2, NR2F2/ARP1, PCDH8, WIF1, JAG1, MBP. Amazing!! A handful of genes that seem to label subpopulations of projection neurons in the frontal cortex. Polymorphic markers for these genes would surely be powerful tools for imaging-genetic studies on cognitive development. In the second paper, the authors compare infra vs. supragranular gene expression in post-mortem brains from patients with schizophrenia and healthy matched controls. Using the same methods, the team reports both supra- and infragranular gene expression changes in schizophrenia (400 & 1200 differences respectively) – more than 70% of the differences appearing to be reductions in gene expression in schizophrenia. Interestingly, the team reports that the genes that were differentially expressed in the infragranular layers provided sufficient information to discriminate between cases and controls, whilst the gene expression differences in the supragranular layers did not. More to the point, the team finds that 51 genes that were differentially expressed in infra- vs. supragranular expression were also differentially expressed in cases vs. controls (many of these are also found to be associated in population genetic association studies of schiz vs. control as well!). Thus, the team has identified layer (function) -specific genes that are associated with schizophrenia. These genes, the ones enriched in the infragranular layers especially, seem to be at the crux of a poorly functioning frontal cortex. The authors point to 3 such genes (SEMA3E, SEMA6D, SEMA3C) who happen to members of the same gene family – the semaphorin gene family. This gene family is very important for the neuronal guidance (during radial migration), morphology, pruning and other processes where cell shape and position are regulated. The authors propose that the semaphorins might act as “integrators” of various forms of wiring during development and in adulthood. More broadly, the authors provide a framework to understand how the development of connectivity on the frontal cortex is regulated by genetic factors – indeed, many suspected genetic risk factors play a role in the developmental pathways the authors have focused on.